Pharaoh, King of Egypt, a most powerful king, wakes up in a cold sweat. His heart is beating fast, his soul is disturbed. The Aramaic translator says, "Umeetarfoh rohei", his spirit was driven crazy. A bad night's sleep, a crazy dream, and then another crazy dream, sleepless nights, nothing makes any sense. Pharaoh will not be quieted, he calls for his advisers, his dream interpreters, but none can solve the dream to his satisfaction. None that is until he calls Yosef, Joseph the Hebrew. His Egyptian interpreters give personal interpretations of these dreams; you shall give birth to seven daughters but you shall bury seven daughters. But Pharaoh knows this is not a dream suitable for a powerful king, it must mean something more, there is a message here for a king. So one of his ministers remembers Joseph, Yosef HaIvri, Joseph the Hebrew, still sitting in prison on false charges. Suddenly Yosef is recalled, rushed out of prison, washed and dressed up and presented to the king. Now the king needs him. Yosef tells him that seven great years are coming, years of plenty, great crops, affluence, riches, but ...they shall be followed by seven years of drought and famine, seven years so terrible that all the riches of the good years shall be totally forgotten. Now this is a dream suitable for a king! A dream with national ramifications. Pharaoh King of Egypt must now take action to protect his people and prevent the decline of his empire. The time to act is now. He has a mission. Yosef takes a bold step and offers advice. You shall seek a wise man who shall gather all the excess produce of the affluent years, and you shall store them for the seven years of famine. Ahh, says Pharaoh, is there any man as wise as you!! Now Pharaoh knows what to do. He has his purpose and his plan but do we? But are we wise? Where is our Joseph? Where is our wise man? Our seven good years are now, any year where we are safe and well and free from harm is a good year. And every now and then we have a bad dream, we are shaken up. But usually it is not a dream, it is reality. Someone we know gets attacked, a synagogue or a school is attacked by terrorists, someone is violated. And we are upset. We wake up in a cold sweat and we want advice. What should we do? Now to be honest, the advice that Yosef gave, well, his dream interpretation was great but the advice should have been obvious. Pretty simple, during your successful times put some money away for "a rainy day"; Basic common wisdom. You had a great year, put some money aside because it is rare that every year is great. Put something away for your old age. But sometimes basic wisdom escapes us. And suddenly "Is there a man in all the land as wise as you!" But look at us! Every day we hear about drunk drivers but yet we allow ourselves "only a couple of beers" and still drive. We know that 25% of all female American college students will report a sexual attack against them during their four years of college, but yet Krav Maga is still not made part of our curriculum or life. We know that violence is on the rise all over the world, there are cities that even the police dare not enter and yet...we are still waiting for our Yosef, for a wise man to come along and give us this great advice that during the good years we should prepare for the bad times and then, perhaps, we shall survive the bad times. Why wait? What are you waiting for? Perhaps during the years of famine you will go looking for a job? None shall be found. Wait until someone you love has been beaten, robbed or raped and then you will sign up for Krav Maga? What are you waiting for? For Yosef to come back? Just read the book and the advice is already there. For us the Torah is our guidebook and the lessons still hold good today. If you wake up in a cold sweat it is clear that something is troubling you, very deeply. Most of us cannot just "call for our advisers and therapists and dream interpreters" but we can read The Book. Find an IKI Krav Maga instructor near you. 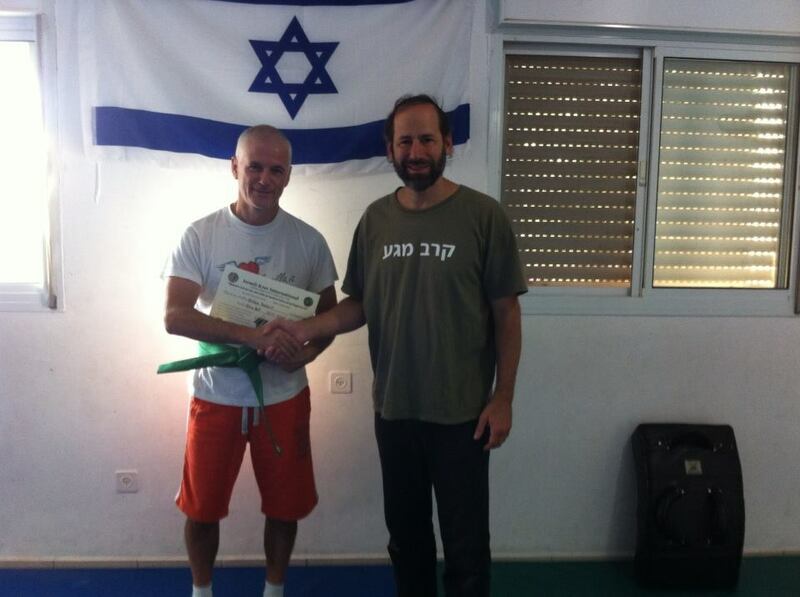 My students travel from all over the world to train with me here in Maaleh Adumim, some privately, some as part of Tour and Train. My neighbors see our group training in the parking lot, or practicing stick attacks in the park, or eating as a group in our mall. And they ask "Where are these people from and why did they travel so far to be here in our little town?" Well they come from New Zealand and Zimbabwe, from South Africa and South America, from Australia and from Austria, from China and from Chile. And they come to train in Krav Maga. And the answer is that they have heard the words of Yosef, Joseph. They have interpreted the dream and come to the Promised Land to train at the source. They have taken time and money during the good years and invested in themselves so that for them and their loved ones the "bad times" should never, ever, ever come! And indeed I look at them and say, "you are the wisest in the land". You will be the Joseph of your community. Stefano came from Rome, Italy, to train for his personal protection. Register for Tour and Train. Reserve your spot.